George Dario Marino Franchitti, MBE (born 19 May 1973) is a British former racing driver from Scotland. He is a four time IndyCar Series champion (2007, 2009, 2010, 2011), a three-time winner of the Indianapolis 500 (2007, 2010, 2012) as well as a winner of the 24 Hours of Daytona (2008). Franchitti started his career in his native United Kingdom in the early 1990s, competing in Formula Vauxhall and Formula Three and was also the winner of the McLaren Autosport BRDC Award in 1992. After Franchitti did not secure a single-seater drive in 1995, he was contracted by the AMG team to compete in touring cars in the DTM and its successor – the International Touring Car Championship. Despite 2 seasons with relative success, the series folded at the end of the 1996 season, again leaving Franchitti without a drive. Mercedes placed Franchitti in CART in 1997 with the Hogan Racing team. Franchitti spent 6 seasons in CART, where he won 10 races with the Team Green squad that he joined in 1998; he failed to win a championship title, with a best final position of 2nd-place in 1999, behind Juan Pablo Montoya in a tie-breaker. Team Green moved to the IndyCar Series for the 2003 campaign, with Franchitti remaining in the team. Franchitti's first season for IndyCar was disrupted by an injury, but won his first races the following season. His break-out year came in 2007, when he won the rain-shortened Indianapolis 500 as one of 4 victories in his route to a first career championship title in a final-race title decider with Scott Dixon. At the end of the season, Franchitti was named as BBC Scotland's Sports Personality of the Year. After an ill-fated move to NASCAR in 2008 (which ended after half a season) Franchitti returned to IndyCar in 2009, driving for Chip Ganassi Racing. Franchitti won on his 2nd start back in the series, and eventually took 5 wins as he won a 2nd championship, again in a final race championship decider against Dixon and Team Penske's Ryan Briscoe. He retained the title in 2010, again with a final race championship win over Penske's Will Power; Franchitti's strong form on ovals – including a 2nd Indianapolis 500 victory – allowed him to overhaul Power by 5 points at the final race. His 3rd consecutive and 4th overall title came in 2011, in which he battled Power for the championship the second time but the championship win ultimately was decided in favour of Franchitti, after the season's final race was abandoned due to a serious crash that resulted in the death of his close friend and former teammate Dan Wheldon. A new car was introduced for the 2012 season, in which Franchitti only scored 1 victory – in the Indianapolis 500 – to become the 10th driver to win at least 3 Indianapolis 500's during a career. On 6 October 2013, Franchitti was involved in a serious crash in the Grand Prix of Houston, when his car flew into catch-fencing after contact with the cars of Takuma Sato and E. J. Viso. Franchitti suffered 2 fractured vertebrae, a broken ankle, and a concussion in the crash. A month later, on 14 November, Franchitti announced his immediate retirement from motor racing on medical advice; he retired with 31 victories from 265 starts in his American open-wheel racing career, a tally which put him in a tie for ninth on the all-time wins list with former teammate Paul Tracy. Franchitti was born in Bathgate, West Lothian, Scotland. While attending Stewart's Melville College in Edinburgh, he became interested in karting. Allan McNish credited a large part of the start given to himself, Franchitti and David Coulthard as being down to David Leslie senior and junior. Franchitti won the Karting Scottish Junior Championship in 1984, the British Junior Championships in 1985 and 1986 and the Scottish senior title in 1988. He progressed to Formula Vauxhall Junior where he won the championship with four victories in 1991. He moved up to Formula Vauxhall Lotus in 1992, where he joined Paul Stewart Racing. In his first year, he finished fourth in the overall championship, and was named the McLaren/Autosport Young Driver of the Year. Staying with the team for the next season, he won the championship in 1993. He graduated to the British Formula 3 Championship in 1994, where he finished fourth and won one race in his first year. However, he was not retained for 1995 which was his final year in single-seaters in Europe. Instead, Franchitti was contracted by AMG Racing to drive a works Mercedes C-Class in the German Touring Car Championship and the related International Touring Car Championship, where he finished fifth and third respectively. He continued in the ITC in 1996, finishing fourth overall with one race win. In 1997, Franchitti was offered a deal to become McLaren's test driver which would have seen him flying to Europe to test during the week, returning to America to race in CART. He ultimately turned this down, preferring instead to pour his energies into racing in CART for the Hogan team. Franchitti tested for the Jaguar F1 team at Silverstone in 2000, but the car proved to be problematic. These troubles combined with him still recovering from neck discs ruptured in a crash at Homestead earlier that year. The test was ultimately a disappointment and the door to racing for Jaguar effectively closed. With the demise of the ITC, Mercedes placed Franchitti in Hogan Racing in 1997, making his US debut in the CART Championship Series where his best finish was a ninth at Surfers Paradise. In 1998 he joined Team Green (forerunner to Andretti Green Racing and the current Andretti Autosport), finishing third in the season standings with three wins (his first coming at Road America) and a season-high five pole positions. Franchitti finished runner-up in the 1999 CART season behind rookie Juan Pablo Montoya. Both drivers scored 212 points, but Montoya had seven wins to Franchitti's three and was crowned champion. Franchitti's close friend Greg Moore died in a crash during the final race of the year at California Speedway in Fontana, California. A heavy crash in pre-season testing the next year ruined Franchitti's 2000 season, and he only won once at Cleveland in 2001. In 2002 he won the Vancouver Molson Indy. He dedicated his win to Greg Moore, who was killed in 1999 and was from nearby Maple Ridge, British Columbia. He finished fourth in Champ Car in 2002. Franchitti missed most of the year, and his place was taken by Dan Wheldon at Motegi, Robby Gordon at Indianapolis, and Bryan Herta for the remainder of the year (with Wheldon taking over a regular role from retiring team boss Michael Andretti). Franchitti returned to the cockpit in 2004, and won his first IRL IndyCar Series race on 25 July at the Milwaukee Mile. He followed this win up with a win at Pikes Peak on 22 August. Franchitti returned to Andretti Green Racing again, and had 2 wins. The first win came at Nashville. His last win of the year came at the 2005 season finale at California. On 3 January 2007, Andretti Green Racing announced that Franchitti had re-signed for the IRL team for a tenth consecutive season in American Open Wheel racing. That year he also undertook a limited programme in the American Le Mans Series driving an Acura ARX-01, teaming up with his younger brother, Marino Franchitti and long-time AGR teammate Bryan Herta. On 27 May 2007, Franchitti won a rain-shortened Indianapolis 500, finishing under a yellow flag after an accident involving Dan Wheldon and Marco Andretti following lap 163. The race was halted due to rain three laps later. His prize money of $1.6m was equal to the entire purse for the 1982 race. During the 2007 season, Franchitti survived two huge crashes which saw his car flip upside down both times. The first at Michigan saw him tangle with Dan Wheldon resulting in his car flipping before being hit again by Scott Dixon. The contact with Dixon was only inches away from his head and the accident saw seven cars (including Franchitti) retire from the race. The second flip came a week later at Kentucky. As Franchitti crossed the start/finish line to finish the race, he did not realise that the chequered flag had been waved and continued to race. He crashed into the back of Kosuke Matsuura flipping yet again and hitting the outside wall. Franchitti took full responsibility for the incident. Franchitti won the IndyCar Championship with four wins finishing ahead of Scott Dixon by just 13 points. Dixon ran out of fuel on the last lap of the season-ending race, allowing Franchitti to take the win and the championship, his first championship win since Formula Vauxhall Lotus in 1993. Franchitti returned to the IndyCar series for 2009 in the Target Chip Ganassi Racing No. 10 car, replacing Dan Wheldon who moved to Panther Racing. He debuted for the team in the non-points race at Surfers Paradise in Australia on 25 October 2008. 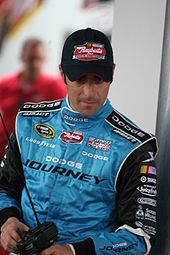 He qualified 4th of 24 drivers and was running third when he spun and stalled the car, resulting in a lap-down finish of 16th. He led 2 laps and set the fastest lap of the race. Franchitti missed the 2008 Indianapolis 500 as he pursued a NASCAR career. He raced several races in the NNS for Chip Ganassi Racing's NASCAR team and only had a few top ten finishes; his best finish was 5th at the 2008 Zippo 200. He decided that IndyCar was his favourite to race in and so he rejoined the IndyCar Series in 2009 with Target Ganassi Racing and went on to win his second, third and fourth IndyCar titles in 2009, 2010 and 2011 as well as the 2010 and 2012 Indy 500. 2009 marked a successful return to IndyCar for Franchitti scooping five wins, two-second and two third placings and taking the series championship in his second consecutive attempt over teammate Scott Dixon by 11 points. Franchitti got off to a steady if unspectacular start; through the first 5 races, Dario had 1 pole, 3 Top 5 finishes and 4 Top 10s. However, at the 94th running of the Indianapolis 500, it all came together for him. Starting on the outside of the first row (#3), Franchitti had the best car of the day, leading over 150 laps to take his 2nd win in the past four years. This is also his 24th win in American Open-wheel driving, placing him in the top 20 all-time. The win also makes him the 18th multiple-win driver in the history of the Indianapolis 500. In October, Franchitti travelled to Australia to compete in a special round of the V8 Supercar championship in which he and 17 other international drivers will pair up with regular V8 drivers in two 300 km (186 mi) endurance races at the Gold Coast Street Circuit, a former venue for Indycar. He will drive for Jim Beam Racing with Steve Johnson. By finishing eighth in the 2010 IZOD IndyCar Series championship final at the Homestead Miami Speedway, and leading the most laps on top of qualifying in pole position, Dario overhauled Will Power's 12 points lead and took the 2010 IZOD IndyCar championship. In effect Dario had won all of the past three championships he entered when his 2008 absence is accounted for. Franchitti, again driving for Target Chip Ganassi Racing, won the season opening road race at St. Petersburg, Florida. He followed that win with additional wins at Texas Motor Speedway (28th victory). He took the pole and the win in the Milwaukee 225 for his 29th victory, tying him with Rick Mears for 9th all-time in American Open Wheel racing. In the final race of the season at Las Vegas, Franchitti had an 18-point lead over Will Power in the points standings. However, a 15-car crash on lap 11 caused the race to be red flagged. After a two-hour delay, IndyCar CEO Randy Bernard announced that Dan Wheldon had died from the crash and the race was formally abandoned. The drivers who were not involved did a five-lap tribute to Wheldon 10 minutes after the announcement. Because the race was cancelled and Power was also involved in the crash, Franchitti won his third consecutive and fourth overall IndyCar championship. Since Power suffered severe damage, Franchitti would have won the championship if the race had continued; therefore, the early stoppage of the race had no effect on the championship points. Franchitti, again driving for Target Chip Ganassi Racing, had a slow start in the first four races. On 27 May, he had an emotional win of the 2012 Indianapolis 500. In reference to Dan Wheldon, Franchitti said in an interview after the race, "I think D-Dub would have been proud of that one." The 500 would end up being his only win of the season and the last of his career, as Franchitti struggled against both Andretti and Penske's teams. In 2013 Franchitti improved on his 2012 season. At the Indy 500, Franchitti was running in the top ten for the final restart, but got loose in turn 1 and scraped across the turn 1 wall in a similar style to Takuma Sato's 2012 accident on the final lap. This brought out a final caution that found one of Franchitti's closest friends off the track, Tony Kanaan winning his first Indy 500 and his first win in a few years. After climbing out of his car, Franchitti was led to the infield hospital. Franchitti was cleared uninjured; and he walked to victory lane to hug Kanaan just before the broadcasting ended. In the second Houston race, Franchitti collided with Takuma Sato and E. J. Viso on the final lap, causing Franchitti to become airborne and fly into the turn 5 catchfence in a similar manner to Kenny Bräck's crash at Texas Motor Speedway in 2003. 13 fans were injured by flying debris, and Franchitti suffered a spinal fracture, right ankle fracture, and a concussion. Due to these injuries, as well as injuries caused by previous crashes, doctors told Franchitti that he risked permanent paralysis if he continued to race. Franchitti then retired from competitive driving, but maintained his affiliation with Ganassi Racing by becoming a competition director. On 3 October 2007, it was announced that Franchitti would move to NASCAR to replace David Stremme in the No. 40 Dodge. He made his stock car debut in the ARCA RE/MAX Series on 5 October at Talladega Superspeedway, qualifying 6th and finishing 17th in the No. 42 Dodge Charger for Chip Ganassi Racing. His move to stock cars had similarities to former CART rival Juan Pablo Montoya's move from Formula One to NASCAR in 2006. Franchitti made his first NASCAR start on 20 October 2007 in the Craftsman Truck Series race at Martinsville Speedway. He drove the No. 41 Dodge Ram truck, owned by Cunningham Motorsports, with Brian Pattie from Chip Ganassi Racing serving as crew chief. He would finish 33rd after being plagued by problems with the rear of the truck during the race. On 26 April 2008, Franchitti suffered a slight left ankle fracture in a hard crash with Larry Gunselman while competing in the Nationwide Series Aaron's 312 race. David Stremme, Ken Schrader, Jeremy Mayfield, and Sterling Marlin all filled in for him. On 1 July 2008, Franchitti's No. 40 Sprint Cup team was disbanded by co-owner Chip Ganassi because of a lack of sponsorship. 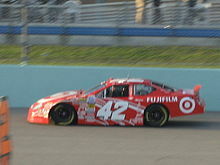 Franchitti was running 41st in points in the Sprint Cup Series at the time, and Ganassi had been funding the team out of his own pocket. The entire No. 40 team was shut down, and 71 employees were released. Franchitti would continue to drive for Ganassi in the Nationwide Series for the remainder of the season following the disbanding of the Cup team. On 9 August 2008 Franchitti won his first career Nationwide pole at Watkins Glen. 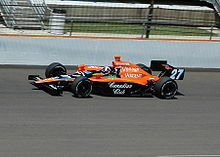 Starting alongside Robby Gordon, Franchitti led 13 laps and came close to the win. He battled Jimmie Johnson throughout the day, but was overtaken by some drivers late in the race. Franchitti finished 5th while Johnson ran out of gas. Franchitti is well known for combining partial Sports Car racing schedules during his IndyCar and NASCAR career. At the 2007 12 Hours of Sebring he finished 1st in LMP2 class with Andretti Green Racing teammates Bryan Herta and Tony Kanaan. They finished 2nd overall. He also participated in the 2007 ALMS Grand Prix of Long Beach with Bryan Herta and they finished 6th. He placed 18th in LMP2 class in the 2007 American Le Mans Series season standings with 32 points. Prior to the 2008 NASCAR Sprint Cup Series, he joined Chip Ganassi Racing teammate Juan Pablo Montoya, Scott Pruett and Memo Rojas and won the Rolex 24 at Daytona in a Lexus-Riley. That was the only race he participated in during the 2008 Rolex Sports Car Series season and finished 42nd overall in Daytona Prototype class with 35 points. In the 2008 Petit Le Mans he was a driver for Highcroft Racing with Scott Sharp and David Brabham. They were the first retirement after only 16 laps. For the 2009 Rolex 24 at Daytona he once again drove for Chip Ganassi Racing in a Lexus-Riley. He finished 5th overall with Scott Dixon and Alex Lloyd. He participated in the 2009 12 Hours of Sebring for Highcroft Racing with Scott Sharp and David Brabham. They finished 15th overall and were the first non-finishers. He returned to Highcroft Racing with Scott Sharp and David Brabham for the 2009 Petit Le Mans. Franchitti is the son of Marina and George Franchitti, both born in Scotland. Most of his ancestry is Italian, with some Scottish. Originally from Bathgate, his family moved to nearby Whitburn when he was eight years old. He is a former pupil of Stewart's Melville College and he supports Celtic Football Club. Franchitti married American actress Ashley Judd in December 2001 at Skibo Castle near Dornoch, Scotland. They divorced in 2013. Franchitti has since married Eleanor Robb, an Englishwoman; their daughter Sofia was born in 2015. He lists some of his favourite television shows as Gavin & Stacey, Shameless and Rab C. Nesbitt. Franchitti was appointed Member of the Order of the British Empire (MBE) in the 2014 Birthday Honours for services to motor racing. He is the older brother of Scottish racing driver Marino Franchitti. He is the cousin of former Formula One driver Paul di Resta. Franchitti has appeared on several television shows. The list includes The Morning Show with Mike & Juliet, Larry King Live, Pardon the Interruption, Late Show with David Letterman, Live with Regis and Kelly, Jim Rome Is Burning, and three times on The Late Late Show with Craig Ferguson. He also appeared as a Scottish news anchor in the animated film Turbo. He is the world feed co-commentator (alongside Jack Nicholls) for the FIA Formula E Championship since 2015–16 season. On 13 October 2011, 3 days before Franchitti's bid for a fourth IZOD IndyCar Series title and the death of his friend and fellow driver Dan Wheldon, it was announced that he would be joining Wheldon in developing the vehicle physics on Ignite Game Technologies’ online auto racing game, Simraceway. A vintage car racing enthusiast, Franchitti will be focusing on ensuring the authenticity of the game's historic and vintage cars "It's almost impossible to describe the feeling you get inside when you’re behind the wheel of an old race car but what I hope to be able to do is use my knowledge and experience to help the team at Simraceway replicate how it feels to drive,". * Franchitti and Juan Pablo Montoya tied on points in the championship, but Montoya was crowned champion because he won 7 races to Franchitti's 3. 2 Cancelled due to death of Dan Wheldon. ^ "Andretti Green Racing Team Profile". Acura. 3 January 2007. Archived from the original on 29 August 2008. Retrieved 2 December 2008. ^ "Lack of sponsorship forces Ganassi to shut down Franchitti's team". ESPN. Retrieved 15 July 2009. ^ "Franchitti in, Wheldon out at Target Chip Ganassi Racing". Yahoo. Retrieved 15 July 2009. ^ "Franchitti surprised to win 2009 title". Racer. 11 October 2009. Retrieved 16 November 2013. ^ "Franchitti: 2010 title harder than '09". Racer. 3 October 2010. Retrieved 16 November 2013. ^ Blount, Terry (17 October 2013). "Wheldon's death casts pall over sport". ESPN. Retrieved 16 November 2013. ^ "Franchitti announces retirement". Yahoo! Eurosport. TF1 Group. Reuters. 14 November 2013. Archived from the original on 3 December 2013. Retrieved 16 November 2013. ^ "Dario Franchitti: IndyCar champion fractures spine in crash". BBC Sport. 7 October 2013. Retrieved 16 November 2013. ^ "Dario Franchitti: Indycar champion forced to retire on medical advice". BBC Sport. 14 November 2013. Retrieved 16 November 2013. ^ Lewandowski, Dave (5 November 2013). "2013 season movers: Climbing the all-time lists". IndyCar Series. IndyCar. Archived from the original on 10 November 2013. Retrieved 16 November 2013. ^ "Sports Round-up". The Daily Telegraph. London. 8 May 2003. Retrieved 20 July 2009. ^ "First IRL victory thrills Franchitti". ESPN. Retrieved 15 July 2009. ^ "Franchitti gets second win; Rice has disaster". ESPN. Retrieved 15 July 2009. ^ "Franchitti feels right at home, wins in Nashville". CBS Sports. Archived from the original on 23 July 2012. Retrieved 15 July 2009. ^ "Franchitti Leads Honda Sweep of Fontana Finale". Honda. Retrieved 15 July 2009. ^ Perez, A.J. (3 January 2007). "Franchitti back with Andretti Green Racing for 2007". USA Today. Retrieved 15 July 2009. ^ "The Franchitti factor". Indycar. Archived from the original on 14 November 2007. Retrieved 20 July 2009. ^ "Franchitti wins Indianapolis 500". Indianapolis Motor Speedway, Speedway, Indiana: ESPN. Associated Press. 31 May 2010. Retrieved 31 May 2010. ^ "Dario Franchitti wins 3rd Indy 500". CNN. 28 May 2012. ^ Williams, Branden (6 October 2013). "INDYCAR: FRANCHITTI SUFFERS SPINAL FRACTURE, 13 FANS INJURED IN HOUSTON CRASH". Fox Sports. Archived from the original on 27 February 2014. Retrieved 29 January 2017. ^ "IndyCar star Franchitti retires month after crash". Associated Press. Archived from the original on 17 December 2014. Retrieved 11 July 2014. ^ "Franchitti announced as Chip Ganassi's NASCAR driver". Yahoo. Retrieved 15 July 2009. ^ "Franchitti finishes 17th on ARCA debut". Autosport. 6 October 2007. Retrieved 15 July 2009. ^ "Franchitti retires on NASCAR debut". Autosport. 20 October 2007. Retrieved 15 July 2009. ^ "Scots star Dario Franchitti escapes horror crash with broken ankle". Daily Record. Retrieved 15 July 2009. ^ Livingstone, Seth (28 April 2008). "Stremme will replace Franchitti for Talladega ride". USA Today. Retrieved 15 July 2009. ^ "Schrader to replace injured Franchitti at Richmond". TSN. Retrieved 15 July 2009. ^ "Mayfield to drive No. 40 for injured Franchitti at Dover". NASCAR. Retrieved 15 July 2009. ^ "Franchitti loses drive in Nascar". BBC Sport. 2 July 2008. Retrieved 4 September 2014. ^ "Franchitti Takes Zippo 200 Pole". Watkins Glen. Archived from the original on 7 January 2011. Retrieved 15 July 2009. ^ "Herta, Franchitti: Green-flag stop stuffed us". Crash.net. Retrieved 15 July 2009. ^ Cotton, Andrew (28 January 2008). "Dario Franchitti wins Daytona 24 Hours title". The Daily Telegraph. London. Retrieved 15 July 2009. ^ "Franchitti to enter Petit Le Mans". Autosport. 17 September 2008. Retrieved 16 July 2009. ^ "Franchitti rejoins Highcroft for Sebring". Autosport. 25 January 2009. Retrieved 16 July 2009. ^ "ALMS: Franchitti Rejoins Highcroft For Petit Le Mans". Speed TV. Archived from the original on 24 July 2011. Retrieved 12 October 2009. ^ "The west of Lothian question: An interview with Bathgates's hero Dario Franchitti". The Scotsman. Retrieved 11 July 2014. ^ Longmore, Andrew (18 April 1999). "Motor racing: Interview – Dario Franchitti: Super Dario driven by the twin forces of ancestry". The Independent. London. ^ "FRANCHITTI ON COURSE TO FINISH NO. 1". Retrieved 29 January 2017. ^ Eason, Kevin (29 May 2007). "Franchitti is a true American idol but his heart belongs to Glasgow". The Times. London. Retrieved 15 July 2009. ^ Young, C. (14 December 2001). "Week in Review: Winona Busted; Ashley Gets Married". Us Weekly. Retrieved 30 January 2013. ^ "Second star wedding for Highland town". BBC News. 7 December 2001. Retrieved 2 December 2008. ^ "Dario Franchitti at home". Archived from the original on 13 May 2014. Retrieved 21 May 2014. ^ "The west of Lothian question: An interview with Bathgates's hero Dario Franchitti". Scotland on Sunday. Archived from the original on 2011-06-09. Retrieved 16 July 2009. ^ "No. 60895". The London Gazette (Supplement). 14 June 2014. p. b19. ^ "Birthday Honours 2014 List" (PDF). Government of the United Kingdom. 13 June 2014. Retrieved 13 June 2014. ^ "Queen's Birthday Honours: Davies, Gatland, Edwards recognised". BBC Sport. 13 June 2014. Retrieved 13 June 2014. ^ "Dario Franchitti". IMDb. Retrieved 11 July 2014. Wikimedia Commons has media related to Dario Franchitti.